1. The eyes work when doing this to keep the blinking. 2. Why all my faces blend together and smooth out? It is essentially what i want this to be just without this smoothing. I've tried everything i can think off. Lol, whoops. haha thanks kal. I got your reply on Discord. I have managed to do it. It's super hard to explain exactly what the issue was but i'll try. To stop the blending i needed separate each object by it's individual Material. And then for some reason putting them back together fixed it. No clue why. The UV's did turn out to be the issue for the eyes. For the correct blinking behaviour you need three groups with textures. 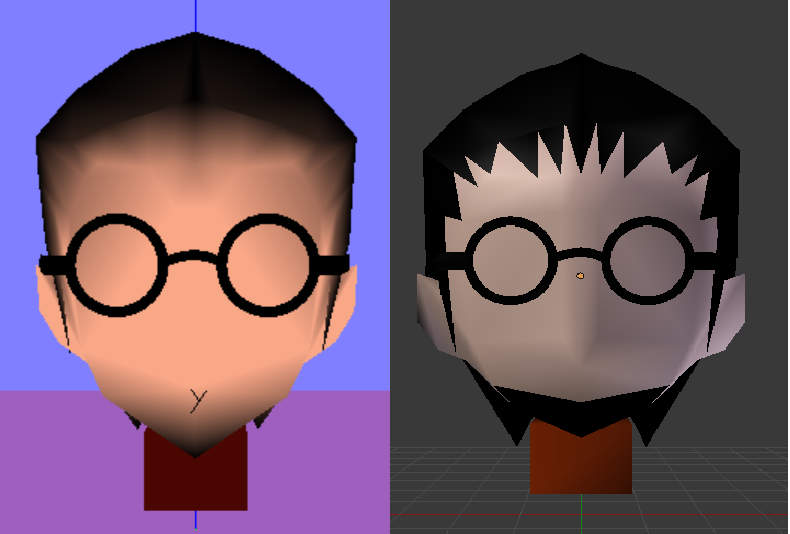 The game looks for the first textured group in the hierarchy the mesh has and replaces it with the left closed eye. Then it looks for the next group for the right eye and at last it replaces the third group if present with the mouth. Yeah, my problem is group 1 is an eye, 2 is the moth and 3 is the other eye. There are two ways. First way delete all groups except of one and save it as a new file do this with all groups until you have separated them. Then load the file in the order you need them step by step into Kimera with the add part to the bone button. Then save the model and merge the parts if Kimera ask you to do that. The problem is that Kimera likes to play Tabula Rasa with the meshes when it should merge them. The second way involves a bit more work but it will work more reliable. Separate the files as I described it above. Then bitrun to convert the files to 3ds files and after that you need p creator to rebuild the p file from the 3ds files.